Week 1 of the 2014 preseason is in the books and alas, The Shield™ will be with us until next February. 1. Brian Hoyer is probably a better quarterback than Johnny Manziel (especially now)…but it doesn’t matter. At day’s end, Hoyer is essentially a career backup (until joining the Browns) that Cleveland brought in under a different head coach. Johnny Football Manziel is going to start much sooner than later. He’ll put fannies in stadiums and be an exciting player. Whether he is a good NFL quarterback remains to be seen. 2. 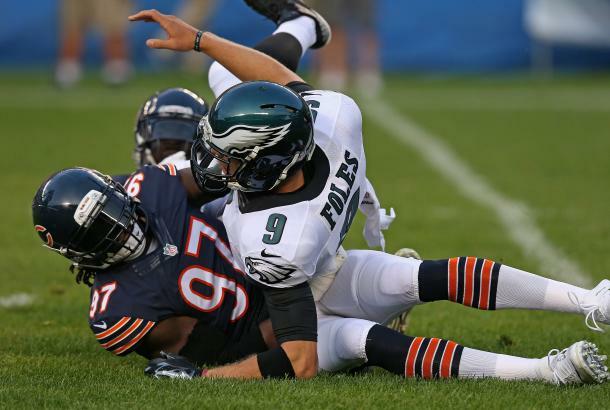 As an Eagles fan, I’m not going to panic about Nick Foles throwing two interceptions against the Bears in his first preseason outing…BUT there seems to be a general assumption that Foles is Philly’s franchise quarterback from here on out. Why is this assumed? 3. Nearly every NFL pundit paying attention to New Orleans has already said this but pay attention to Brandin Cooks (fantasy alert!). He posted five catches for 55 yards and a score versus St. Louis. 4. Speaking of the Rams, it’s nice to hear Michael Sam’s name without hearing the words “Tony Dungy” or “gay”. Let the kid play football and the rest will take care of itself. 5. So, Ryan Mallet…Are we sure he can play? In a league thirsty for NFL quarterbacks, he is still a backup and probably the third-best quarterback on that team behind Brady and Jimmy Garropolo. 6. Did you see the Garoppolo fades versus Washington? Spectacular. 7. Denver is putting most of their eggs in this year’s basket. I hope for the sake of Broncos fans that Aqib Talib and DeMarcus Ware are still standing by season’s end. Recent history states that might be a chore. 8. Josh McCown’s 2 of 4 for 20 yards and an interception was a rather ominous way to begin his run in Tampa. 9. Texans head coach Bill O’Brien called Houston’s performance during a 32-0 loss to Arizona “terrible.” That’s probably being kind. 10. The Buffalo Bills backfield situation is going to give fantasy football folks a collective headache by season’s end.